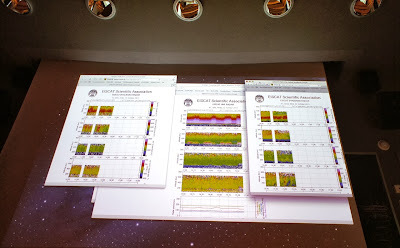 EISCAT real-time data on the big screen of the auditorium. On Tuesday, 22nd October, the Finnish high-school students taking part in the Space Weather Science Camp on Svalbard had the big night of their EISCAT Svalbard Radar experiment. 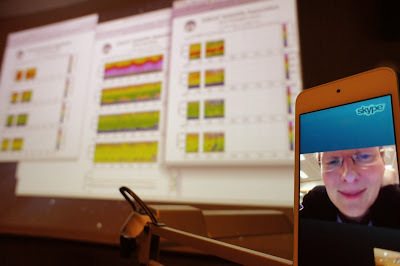 First, the students produced their own space weather forecast for the radar experiment time at 14-16 UTC. And yes! There was to be aurora, everyone concluded. Only moderate activity, but aurora was expected to be visible in the radar beam, somewhat south of Longyearbyen. Thus it was decided to tilt the antenna southward. Some hectic calculations were done, and a suitable antenna elevation was selected by the "PI team", i.e. all the students in the auditorium. Monitoring the EISCAT Experiment in the UNIS auditorium "Lassegrotta". The radar experiment itself was run at the EISCAT Svalbard Radar site by the "engineering team", aurora expert Noora and the co-ordinating teacher Risto, while the students were seeing radar data being accumulated on the big screen in the auditorium. As the aurora signatures appeared on the radar plots, all possible space weather data was followed carefully. 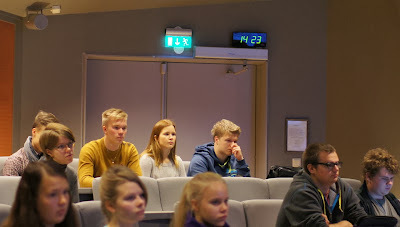 As a bonus the students could also follow the Tromsø radar and the active heating experiment conducted there at the same time. Skype connection between the ESR site and UNIS auditorium was in a small iPod. Noora Partamies was updating us on what we see on the data screens. 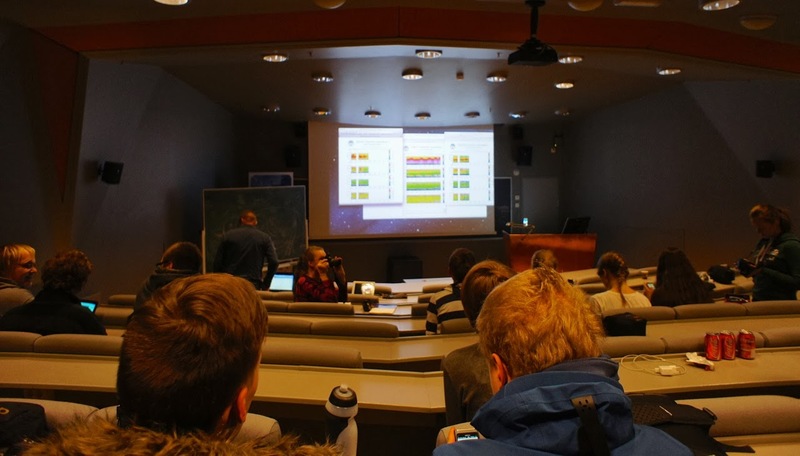 A continuous Skype connection between the engineering and PI teams was connected to the loudspeakers of the auditorium and made all the discussion on data very lively. The skies were cloudy, so we did not get any visual observation of aurora.